Gilbert & Jones | Why Us? Enduring Relationships Require Good Chemistry. Your business is important to us. Gilbert & Jones supplies more than 150 specialty chemicals, from acetic acid to zinc oxide, all competitively priced to deliver high quality products at affordable values. We also provide anodes and metal finishing equipment including drums, vats, totes, bulk containers, rectifiers, blowers/fans, scrubbers and reclamation units, along with a complete range of accessories. 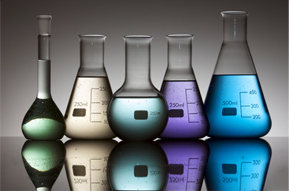 Count on us to have your chemicals and equipment in stock when you need them. Our climate-controlled and ventilated, 25,000-square-foot facility provides ample storage for over 150 name-brand chemicals and equipment used by the metal finishing and waste treatment industries, so our inventories are always in stock. We carry the brands of the industry’s most prominent manufacturers, including MacDermid, Henkel, Xstrata/Falconbridge and Coventya. To ensure safe, secure and speedy delivery of every order, Gilbert & Jones maintains a fleet of delivery trucks operated by its own trained and trusted employees. Many of the chemicals you rely on to solve your industrial challenges are powerful workhorses that significantly extend the life of products made from metals. The metal pretreatment technologies used by the water purification, aerospace, automotive, electronics and other industries have a wide range of common industrial applications. Some may enhance corrosion, wear or electrical resistance, while others enhance anode ability to bond to rubber or improve solderability, depending on their application. Many of these chemicals require special handling, storage and disposal. Gilbert & Jones’ highly skilled staff understands that the evolving chemical industry demands up-to-the-minute compliance knowledge and best practices training. Gilbert & Jones ensures full compliance in several ways. We back our commitment to ongoing training with our own in-house training program. We also routinely qualify new chemical orders by determining how the product will be used to ensure appropriate use, processing and disposal. We provide backup testing of various processes in our full-service lab. And we partner with third party vendors to provide full support to troubleshoot post-sale issues. Gilbert & Jones has been at the forefront of environmentally safe business practices, favoring water-based cleaners as alternatives to ozone-damaging solvents long before regulation mandates. We routinely recycle the 55-gallon drums used for all our chemical deliveries, keeping these containers out of the waste stream. Gilbert & Jones is an ISO-certified company and a member of the National Association of Chemical Distributors (NACD). We share NACD’s commitment to third-party verified monitoring to ensure performance improvement in every phase of chemical storage, handling, transport and disposal. Our technically proficient sales representatives offer hands-on expertise and boast an average tenure of over 30 years of industry experience, so they can easily field questions involving processes, not just orders. Gilbert & Jones offers its employees the stability of a solid company with 20 years in the business, so every employee ̶ from senior management to warehouse staff and delivery drivers ̶ enjoys the benefits of continuity. What’s more, we believe our low employee turnover enhances the safety of our product lineup. Our industry experience benefits customers in multiple ways. A keen understanding of inventory control and just-in-time production strategies improve efficiencies, helping us plan purchases and shipping. Our sophisticated customer database enables us to track customer consumption and purchase patterns dating as far back as 1994. By practicing sound fiscal management and prudent inventory control, we can pass on to customers the savings we enjoy by minimizing waste. While many chemicals may expire or deteriorate if exposed to excessive heat, moisture or other less-than-ideal environmental conditions, we remain committed to ensuring that customers receive the freshest materials possible. Turn to Gilbert & Jones for help in meeting your industrial challenges. Call us today at (800) 577-2962.